Renewable energy for communities promotes a more democratic energy system -- especially community solar, which hits the sweet spot between household rooftop solar and remote industrial-scale solar installations. Find out why. /By Armando Gaetaniello/ A couple of months ago we wrote about how local clean energy projects help the environmental justice cause. Ultimately, as we shift away from fossil fuels with a socially-sensitive marketplace of solar projects, we are able to diminish local impacts on human health, air and water. But why are local clean energy projects particularly beneficial to our society and environment? Why is distributed renewable power generation better than centralized generation? As a webinar explained, now that we have the opportunity to break free from fossil fuels, will renewables be under community control or become another tool to accumulate wealth for a few? Here we want to discuss the concept of energy democracy, and why community renewables (wind as well as solar power) are what we need for a truly sustainable and just society. To delve further into it, check this interview. First of all we need to ask, how have we got in this climate mess? The answer is that, broadly speaking, the single-minded profit-driven approach by energy companies has burned out (literally!) major resources of this planet. Now the same perspective could be applied to developing renewable projects, where a few investors with deep pockets may be able to build huge projects[A1] . Their advantage is that they own the necessary starting capital. Within this scenario, only a few companies (and local utilities) will be able to generate clean power. Local communities will not be invited to the table and will not be able to tap into economic benefits. The massive growth of utility-scale solar projects is good news for the climate, but it keeps the present system as it is – where communities have no power because development is just profit-driven and (frequently) corporate. Although it will positively contribute to CO2 emission reductions, utility-scale renewables will also preserve the same power structure that has tipped the balance of the climate system. Proposing solutions applying the same paradigm that has created the problem is bound to be ineffective. Indeed, to combat climate change we need central large projects as well as a lot of decentralized ones, the latter built for the residents and the community. The democracy in power supply only occurs if the end users can influence the “what” and the “how” of deployment and management of renewables. Even better, users are empowered to generate power themselves. They are on the demand as well as on the supply side. And as you all know, the Sun is the most abundant power source on Earth, upon which all other sources depend, and that is freely available to be harnessed. So producing and handling solar power in a democratic way is a no-brainer, because how can any company be so daring as to control a ubiquitous resource? What are the concrete benefits of having decentralized renewable energy projects? [A2] In order to engage everyone, we propose a more inclusive model. We prefer to build smaller solar projects that are closer to and endorsed by the community. We prefer to raise awareness and rally local groups to empower them have clean energy projects in their neighborhood. Shifting away from fossil fuels doesn’t only mean curbing CO2 emissions, it also means switching to a new socio-economic model – and we want to do our part! Neighborhood Sun’s approach entails developing renewables in a more inclusive way, which will favor community and citizen engagement. It will empower all of us to participate in the planning of our towns and the resources used. This is why our slogan is “Building community through local solar power”. For the same reason, we have invited all our followers to give us feedback on our economic propositions, on our social and environmental impact, and how we relate to the local communities. Having a stake in controlling the energy generated means more influence on the way benefits are shared among the various stakeholders. Because there are several projects available in a given utility area, each household would also be able to choose from different options. This is what it will be like with community solar. On the contrary, if there are just a few big central projects, the project developers and managers would sell power to the utility, which will in turn sell it to customers after pocketing their profits. What are the concrete benefits of having decentralized renewable energy projects? In residential and community solar projects, consumers become producers (as some are saying, prosumers). Consequently, they represent important links in the electricity grid, contributing to its reliability and resilience. Moreover, a new grid is also unavoidable because the electricity network is increasingly interdependent with many actors playing different roles, and forward-looking advocates are looking at a “Grid of the Future”. 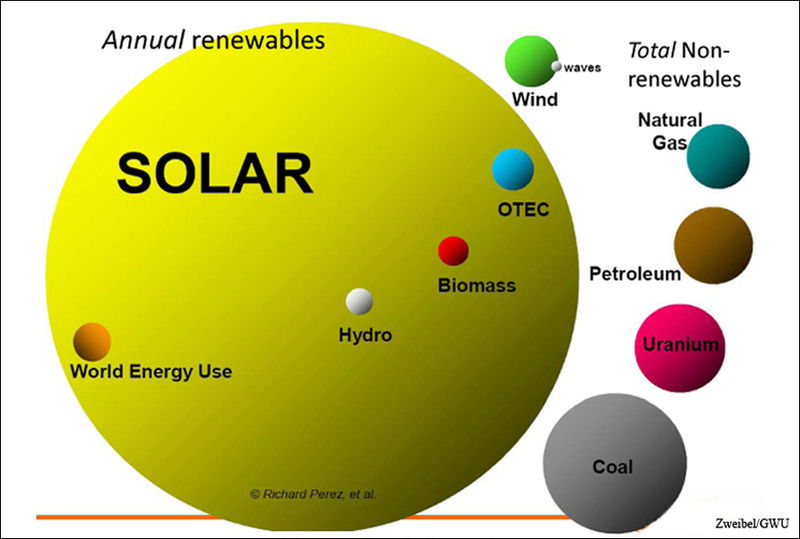 And what about the economics of solar and wind projects with different capacity installed? An extremely valuable resource in this matter is the report released by the Institute of Local Self-Reliance (ILSR). It shows that, although the economies of scale naturally favor large projects, there are several factors that makes each situation way more complicated. Distance from users, added resilience to the grid, and relevant electricity price points happen to weigh more than one may expect. The bottom line here is that while small solar installations (e.g. 5 kW on a house) have no economies of scale, utility-scale solar (bigger than 5 or 10 MW) has its own drawbacks – distance from end users and need for new infrastructure -- that can increase economic costs and impacts on the environment. Community solar, instead, is right-sized to be closer to communities while being cheaper on a per-watt basis* than household solar at its development stage. Distributed solar energy resources are also more effective than huge projects in avoiding intermittency of voltage during different days, hours, and minutes. When the weather presents scattered clouds, and some parts of a community are shaded while other ones are not, some solar array would still be able to generate electricity. Those that are shaded would not be able to do so, or the generation would be really limited. If, instead, clouds impact the centralized solar facility there would be very little solar power generated at all in the same day or hour. This causes stress on the transmission and distribution lines, given the abrupt changes in voltage that the cables carry. All in all, a more democratic energy system is desirable for several reasons. Among these, it offer a more just solution to climate change, apart from being more economically feasible. Get on board the solar train now, you won’t regret it! * Solar development costs are often calculated on a $ amount per Watt developed. Utility-scale solar can be developed at a cheaper rate (often below $1.50 per Watt) than residential solar (almost always above $3 per Watt). Community solar development costs would be anywhere in between.